We believe this was painted in either 1890 or, at the latest, early 1891. 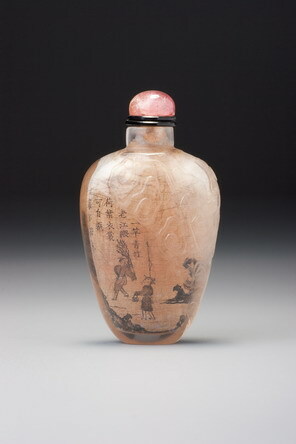 There is little to be learned from the painting itself, which is one of Zhou’s masterpieces in the classic, late style, but the brief inscription, consisting of a signature followed by one seal of the artist, is close in style and scale to bottles such as Sale 3, lot 121, which is dated winter 1890. Only the oblique angularity of it suggests the possibility that it might be from as late as 1891. Here, the blue palette for landscapes so typical of the middle period is replaced by the green palette that predominated in the last few years of Zhou’s career. Like his other classic late landscapes, while appearing superficially similar to the others, it is of a completely different composition. The elements are the same, but each is re-thought, re-invented for the painting at hand. While lesser, later, more commercial artists painted the same pine over and over again from a pattern book, or the same collection of auspicious objects, Zhou never even repeated the shape of a pine tree, let alone a composition. It is obvious that when he painted, he was creating afresh every time. To demonstrate this point, we have included here a series of isolated pine trees from several of Zhou’s works in this collection so that they can be compared (their number in the Treasury 4 is given below each). Another feature of the classic landscapes appears here with the foreground hillocks, left paler in colour than the surrounding mound they form, covered with small, energized, jet-black strokes, all curved in the same direction, to represent the grass on the hilly mounds. Under magnification, they create a delightful chorus of brushstrokes that never falter. It is often in these minor details of a painting that we see the true artist’s total commitment to the work of art. A lesser artist or a more commercial one, dealing with repetitive detail of this sort, which can hardly be seen as separate brush-strokes under normal circumstances, would tend to get sloppy or use an easy way out to achieve the same effect. Zhou has created, in landscape after landscape, a faultless symphony of tiny, energetic strokes, all leaning the same way to indicate the direction of the prevailing wind, and never a single stroke smudged, fudged or less than dynamic. And let us remind ourselves that, even late in his career, in 1890, Zhou stood alone in the art at Beijing. Not a single one of those he inspired and who learned from and copied him had begun to produce any serious paintings by that time.